Over the past four years, we’ve been blessed to get to know extraordinary young journalists from around the country. Not only do we enjoy their company for a week at Stanford, but often they stay in touch with us and ask us for recommendations as they apply to college. We’re happy to say we’ve heard from several alums recently who’ve gotten into college and have let us know that their time at Newsroom by the Bay helped them understand who they are and what they want to do in the world. Nebeyatt Betre (left) and Patricia Jia met each other at NBTB 2013 last summer. Both are heading to college this fall. Patricia Jia, who attended NBTB in 2012 as a Year 1 student, and returned last year as a counselor in training and a member of our Year 2 advanced strand, also has made her college decision. “Great news! I was admitted to the University of Pennsylvania for early decision, so I’ll be a freshman there this fall,” she wrote. Esme Argueta, center left, interviews a San Jose Earthquakes player during NBTB 2013. Esmeralda Argueta, another NBTB Scholar in 2013, will graduate in June from Castlemont High School in East Oakland. This fall, she’ll head to the University of California at Santa Cruz, where she will study environmental science and journalism. Esme spent last summer at NBTB writing stories on climate change and healthy cities (click here for “One Step Closer to a Greener Life”). 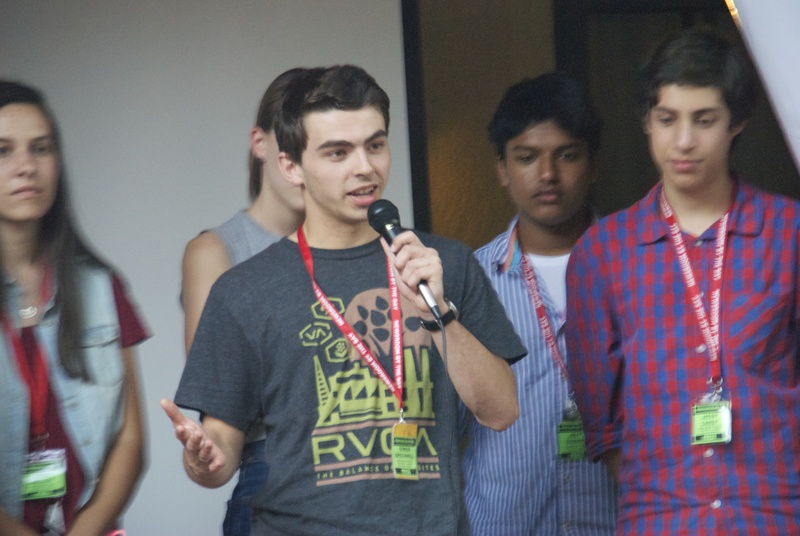 Simon Greenhill takes the mic during the multimedia showcase to describe his team’s pop-up website project. It wasn’t all work and no fun for Ethan Parets, at right, who managed to play a lot of Frisbee at NBTB 2013. If you’re an NBTB alum and you’re getting good news, please email us at newsroombythebay@gmail.com or tweet @NewsroomBTB. We’re proud to see you becoming the next generation of journalists!